Clownfish is an online translator for Skype that can change the pitch of your voice. It has many pre-defined set of voices, like you can speak as a Female, a Baby, an Alien, a Male and many others. It also has some pre-defined greetings that can be sent to your friends on occasions like Birthday, Valentine’s Day, etc. With Voice Call Recording feature you can easily record your conversations. You can change your voice and speak like a Female, a Baby, a Male, a Robot and many other modes. There are many pre-defined greetings that can be sent over Skype. These greeting have animated emoticons and are very pleasing. It includes greeting cards for Birthday, Valentine’s Day, Mother’s Day, New Year and many other. Many features are available for changing your voice like echo, pitch, chorus, etc. There are a huge number of fun and art messages, all containing animated emoticons. Some of the messages are House, Pac-Man, Butterfly. All the incoming messages can be translated into your language. 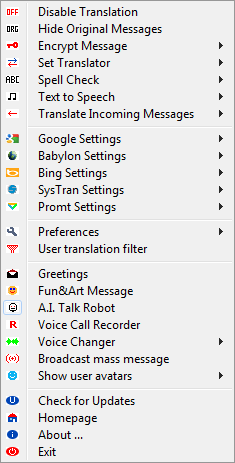 With this feature you can talk to someone else who speaks in any other language. You can also broadcast a single message to all the contacts in your friend list with just a single click. You can also select any music to be played in the background. A.I. talking Robot is a feature that automatically replies to the messages you receive on Skype. This feature is not good at all and gives rubbish answers most of the times. But can be used when you want to irritate someone without killing your own time. There are many more features, unveil them as you use it. Install Skype if you have not installed it. Download it from the official site. Download and install Clownfish. If you have any questions regarding security than you can see the official page for Clownfish on Skype’s official site here. It’s a featured app on Skype. After installation Skype will automatically start and will ask for permission to Allow access to Clownfish. If it does not appear automatically you can manually run Skype. Click on “Allow access” to use Clownfish. Now just look for the Clownfish icon in the taskbar right-click on it and all its features will be displayed as in the first image. 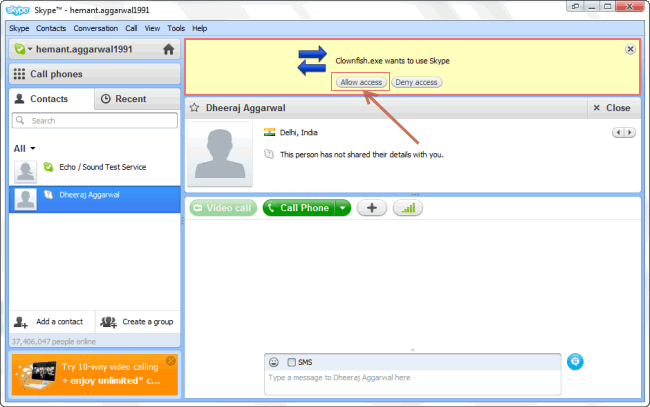 Select any feature you want to use and enjoy enhanced Skyping. Do use the Voice Changer feature, it’s awesome. 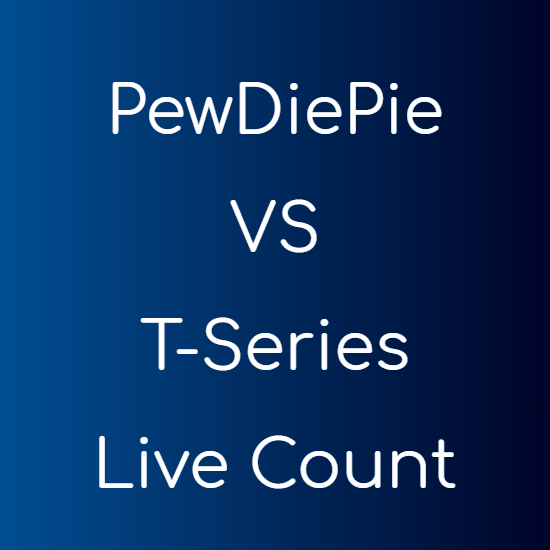 Do comment if you have any issues.